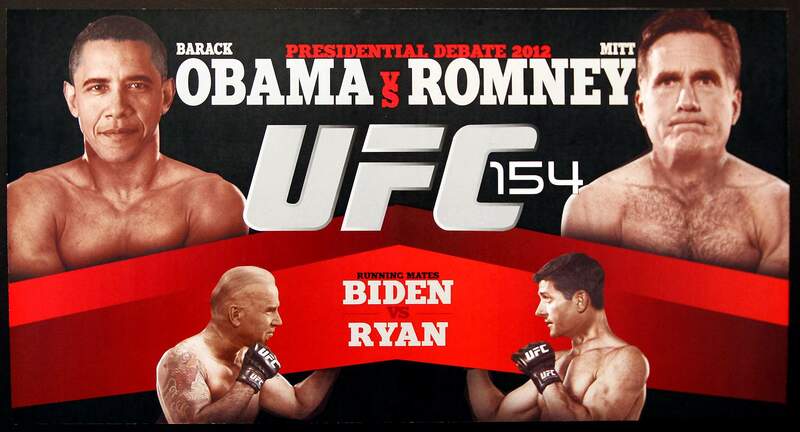 Luke Vanderwiere had some fun at the candidates expense in his digital media rendering Presidential Fight, which was unveiled Thursday at the Fort Lewis College Art Gallery. 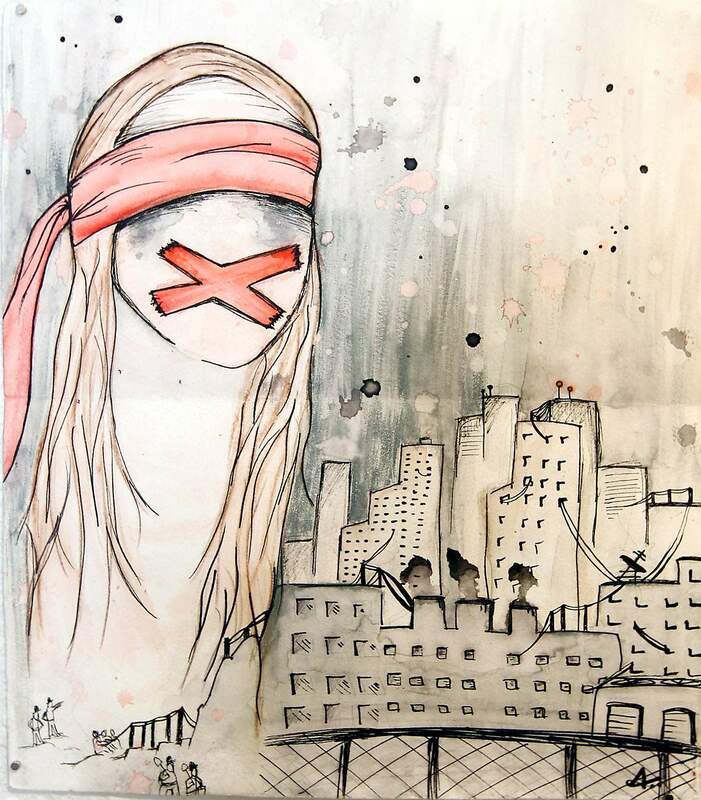 Kristina Orlovskys watercolor Corrupted by Capitalism, Subdued by Materialism is one of the darker pieces in the Political Humor exhibit at the Fort Lewis College Art Gallery. Fort Lewis College Art Gallery Director Elizabeth Gand explains artist Katie Hargraves installation Is this Historical Accuracy at Thursdays opening of the Political Humor exhibition. Adrian Balsaras Untitled probably didnt need a name anyway. 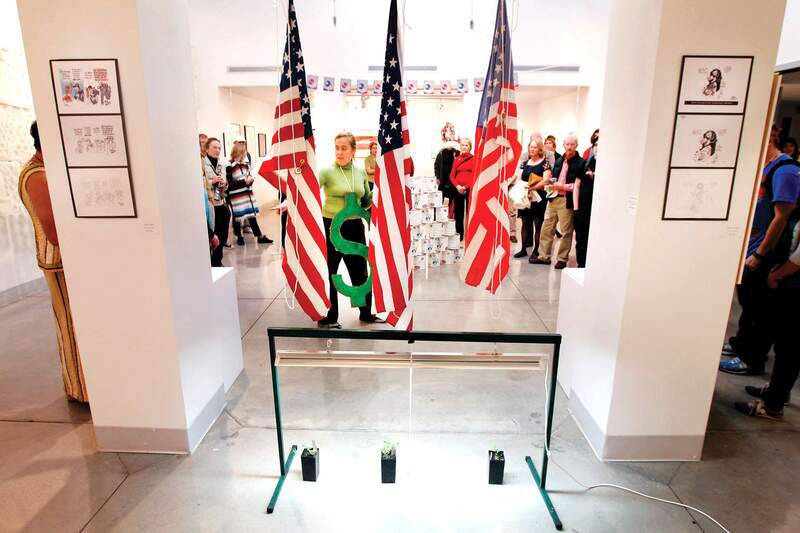 The digital media manipulation is one of the more satirical works in the Political Humor exhibition at the Fort Lewis College Art Gallery. 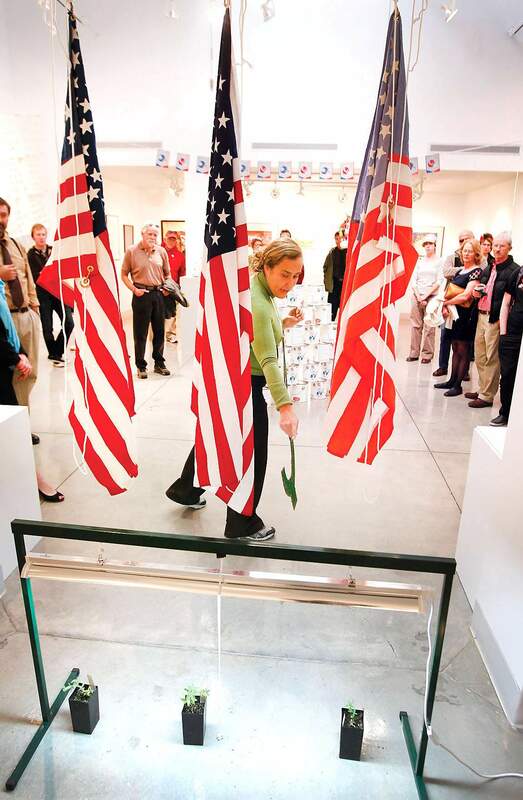 Fort Lewis College Art Gallery Director Elizabeth Gand explains artist Katie Hargraves installation Is this Historical Accuracy at Thursdays opening of the Political Humor exhibition at the Fort Lewis College Art Gallery. 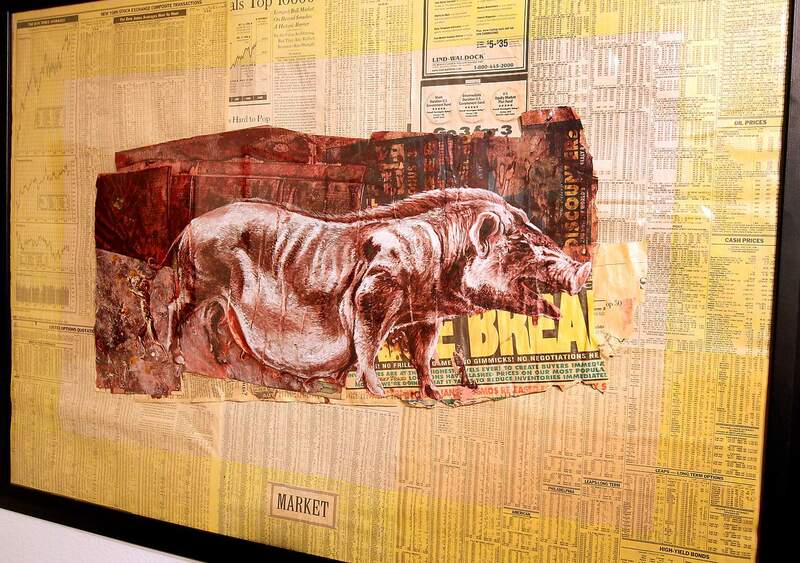 Market is an acrylic on a copy of The Wall Street Journal by artist Andrew Ellis Johnson. Costumes were encouraged at Thursdays opening of Political Humor, and spiritual extremes were as common as political ones. Gallery intern Del Greer, the devil, rubbed shoulders with Clay Brooks, as Jesus, at the Fort Lewis College Art Gallery. 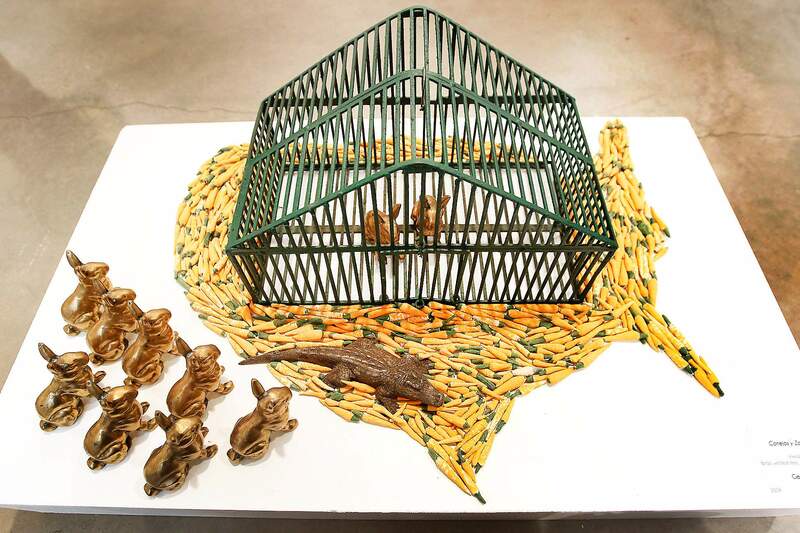 George Lorio created Conejos y Zanphorias from brass, welded steel, cast aluminum and ceramics. Niñas is a mixed-media creation by George Lorio at the Fort Lewis College Art Gallery. If there was any doubt remaining that this election season is a joke, the Fort Lewis College Art Department has removed it. The FLC Art Gallerys Political Humor exhibition is perfectly timed to bring a bit of levity to the madness that will mercifully culminate Nov. 6. Gallery director Elizabeth Gand looked far and wide to find the right cross-section of artists long jaded by the political process. The idea behind the exhibition is, of course, to respond, with playfulness, to the tension surrounding Novembers election, Gand said. The roster of artists was assembled from a national call, and Connecticut artist Jason Noushin wished hed made the trip west for the shows Thursday opening instead of hunkering down as Hurricane Sandy ravages the East Coast. As a British citizen who was raised in Iran and now lives here as a permanent resident, the 42-year old Noushin is a political lampooner with a unique perspective. The other artists who were accepted for Political Humor are Roya Farassat, Eric Garcia, Katie Hargrav, Andrew Ellis Johnson, Carolyn Jaser, George, Brian Piana, Paul Shortt and Durangos Shan Wells. 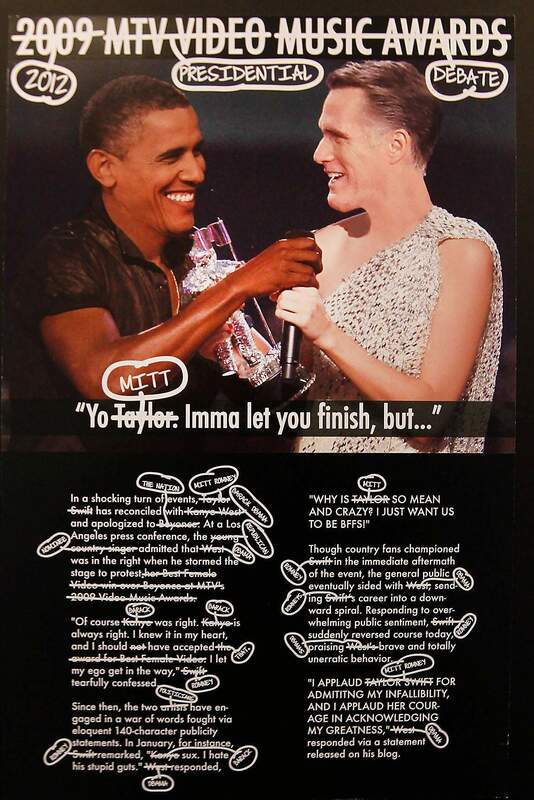 The artists use humor, from the biting variety to the gentle, and the cumulative result is refreshingly nonpartisan. The works tend to mock the system, not the individual players, though the two leading presidential candidates are singled out in a few pieces. The exhibit includes a sanctioned graffiti wall, where any visitor can use the complimentary basic art supplies to add to or detract from the show and its message. Also, a small satellite exhibition of selected works from the show will be on display on Election Day at The Durango Herald offices. Political Humor: Contemporary Artists Take on 21st Century Politics, through Nov. 14 at the Fort Lewis College Art Gallery, 1000 Rim Drive. Hours are 10 a.m.-4 p.m. Monday-Friday and noon-4 p.m. Saturday. For more information, call 247-7167.